Assistant national police chief Damrongsak Kittiprapat has told Thai Media that the first three days of the 7 dangerous Days of New Year has seen 1,633 accidents, 182 deaths and 1,690 injured with the highest death toll in Khon Kaen province and the greatest number of accidents and injuries in Chiang Mai province. The National Broadcasting and Telecommunications Commission (NBTC) is planning to grant free internet access for three years to 1.8 million low-income earners living in border provinces starting from May 2019. Activist Srisuwan Janya has begun collecting signatures at his coffee shop in support of impeaching the anti-graft commissioners over their decision to drop the luxury watch case targeting Deputy Prime Minister Prawit Wongsuwon. Investment incentive schemes under the 7-year strategic investment promotion policy (2015-2021) have been confirmed to contribute 418 billion baht to Thailand’s GDP growth, according to Thailand Board of Investment (BOI). The Thai PM has described the attackers as “opportunists” after a wave of coordinated bomb attacks by suspected insurgents hit Thailand’s “deep south” in the lead-up to new year and the resulting long weekend. Critics of Thailand’s Junta Government have slammed the National Anti-Corruption Commission (NACC) decision to acquit Deputy Prime Minister Gen. Prawit Wongsuwon over the Luxury Watch scandal which prompted public curiosity over their ownership, causing a search that uncovered 22 other luxury watches on his wrist at one time or other. The 18 day operation in July to rescue 12 young footballers and their coach trapped in a Chiang Rai cave was 2018’s most memorable event in Thailand. A team of British divers who helped save a junior football team stranded in a flooded cave in Thailand were awarded in Britain’s traditional New Year Honours alongside former supermodel Twiggy and Monty Python’s Michael Palin. Security in 14 districts of the Narathiwat has been stepped up after suspected militants attacked a tambon defence volunteer’s base in Ra-ngae district and detonated several home-made bombs targeting power poles and bridges in four districts on Friday night. Business and universities are showing admirable readiness to adopt the paradigm shift of the Internet of Things and AI. Thai start-up carrier, Kom Airlines, signed a letter of intent Thursday to acquire six Superjet 100 jets (SSJ100s) from Russian aircraft manufacturer Sukhoi Civil Aircraft Company as part of a Russia-Thailand economy panel. GoJek, formally PT Aplikasi Karya Anak Bangsa, plans to further expand into its target markets in Asean countries next year, continuing the growth of the app-based ride-hailing service that was established eight years ago. The Rubber Authority of Thailand (RAOT) has already handed out the 1st batch of financial assistance worth 161.5 million baht to rubber farmers suffering from the low rubber price issue. A disabled South African pilot was killed when his small plane crashed while attempting to land at Bang Phra airport in Si Racha district Sunday afternoon, police said. The National Legislative Assembly (NLA)’s recent meeting has approved bills related to public health and personal data protection, among others. Prime Minister Prayut Chan-o-cha and Khunying Sudarat Keyuraphan, chief of the Pheu Thai Party’s election strategy committee, were named the most popular male and female politicians in 2018 in an opinion survey by Suan Dusit Rajabhat University, or Suan Dusit Poll. The two new picks for the National Human Rights Commission (NHRC) made by the coup-installed National Legislative Assembly (NLA) raised vital questions about the state’s sincerity in championing the human rights cause. 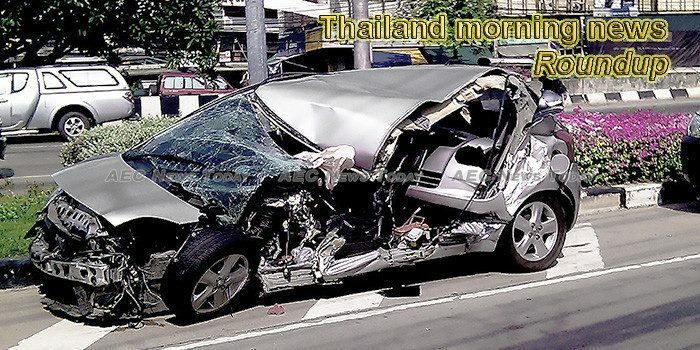 According to the Spokesperson of the Prime Minister’s Office, the Premier has urged holidaymakers to observe road safety measures, pointing out that speeding and operating vehicles under the influence of alcohol (DUI) are the major causes of accidents. The government on Saturday stood firm on its political roadmap and Feb 24 general election amid media reports the polls were likely to be pushed back for a month for a technical reason. The Cityline bus from Kota Bharu takes an hour and a half to cover 50 kilometers and stops with a start 50 meters from the border. The Bank of Agriculture and Agricultural Cooperatives (BAAC) is pushing to establish 2,000 “Valuable Wood Communities”, adding 40 million trees to the nation over the next year. Throughout 2018, much happened in the field of education. Issues involving both the system and personnel were addressed. Here’s a list of the top five headlines from the year. Police have arrested a Russian woman for spray painting graffiti on public roads in Nai Harn, at the southern end of Phuket. The latest AFC Club Competitions Ranking for the year 2018 are out with China topping the chart. His Majesty the King has issued a New Year greeting card wishing the best for Thais. The cover contains the Chakri Dynasty symbol with the royal initial of Her Majesty Queen Sirikit and the king’s royal initial.